Techniques adhere to natural body movements. Vertical punches are favored over rotating or "corkscrew" punches as the former are considered to be stronger, faster and more injurious to the receiver. Strikes are almost always delivered in a snapping (as opposed to a thrusting or pushing) fashion for the same reasons as above. These are the major features and realize - especially if the reader is an Isshinryu person - this list is hardly exhaustive. You can find this info anywhere online or hanging on the wall of most Isshinryu dojo. These tenets have existed in Okinawan karate in various guises dating back to about the eighteenth century, but the founder, Tatsuo Shimabuku, considered these particular ones paramount to his system. There are a total of eight karate kata (pre-arranged forms) in the system. No empty-handed forms are taught after black belt, only weapons (kobudo), of which there are seven. This is a major departure from most karate styles that require students to learn literally dozens of forms, many of which are pinan (beginner) kata, none of which appear in Isshinryu. Isshinryu does not endeavor to perfect the trainee's character or make her/him a good role model or citizen, per se. No lofty aims aside from prevailing in an unpleasant and possibly horrific altercation are sought. Isshinryu techniques are not set in stone, but subject to innovation as needed. Shimabuku, taking a line from The Eight Precepts of The Fist ("Adapt to changing conditions"), sought to advance his art through effective modifications as the opportunities presented themselves. I like the idea that there are only fifteen kata in Isshinryu. That's still an enormous catalogue of techniques. There's an old saying that it takes a lifetime to master a single kata. One style of Okinawan karate has over fifty forms in its kata canon. Somebody's wrong here, big time. At least Isshinryu found a middle ground. None of this is an attempt to one-up another's karate style. Shimabuku would tell his students "All bottles are good; there is no 'best' bottle", a metaphor to express that there may be differences found in karate, but each serves their purpose in their own way. You stated that no empty hand kata are taught after black belt. While this is mostly true, there are some associations that wait to teach Sunsu (Sun-nu-su) until a student reaches Shodan. My own association does this. Rumor is going around that the head of our association wants to save Kusanku until after shodan as well, but I don't know for sure. I practice Wu style Taijiquan. Basically there are the square form and the round form. Xing Yi is founded on the Five Elements, and some people stick with those rather than learning the 12 Animals. In many Ba Gua Zhang styles, there are two sets of 8 palm changes each. The first set is more or less a qigong, and the second set is meant to be of a practical nature. All the palm changes are based on the basic single change palm. For myself, I would rather go deeply and narrowly, rather than widely but more shallow. It seems infinitely practical. There's no fluff, or needlessly fancy or flashy stuff. There's an unadorned elegance to it. Shibumi. The tight, close-in style makes it extremely stable and strong. Any defense or block is also potentially an offensive strike. The snapping strikes make it very difficult for an opponent to trap an arm or a leg. How are things in NY? I really like the posting and am glad that you are back at it. You do put out some very thought provoking information. I especially appreciate the one on the Journey with the Grandmaster, great book. I just wanted to make sure I understand so I plucked out two quotes from your latest and have a comment which I would like to hear back from you on, etc. "Isshinryu does not endeavor to perfect the trainee's character or make her/him a good role model or citizen, per se. No lofty aims..."
I would say that this quote from my perspective is not correct. One of the items presented when Bushi Tatsuo Sensei promoted a Marine to Sho-dan was the "Kenpo Gokui." He also expressed to several of the first gen practitioners that it was important and wanted those who continued their training to study it. The gokui, in my opinion, is that esoteric aspect of the Isshinryu system that opens doors to character, role model or citizen, etc. I would also say that the practice of the physical aspects in regard to Sensei-Deshi | Sempai-Kohai | Tori-Uke if develops properly are teaching us about character and citizenship, etc. What are your thoughts? "Isshinryu techniques are not set in stone, but subject to innovation as needed." I have come to understand that "allowable differences" as put forth in Major Hayes' book do allow form innovation of a kind but in reality the "core" of Isshinryu should remain intact as a base from which all new practitioners/deshi must launch their lives in karate-do. I do believe the spirit of Bushi Tatsuo Sensei was such that those he promoted to Sho-dan and left Okinawa who took it seriously would teach the core and then allow one who has mastered it to a degree to transform their practice into something that would be unique to that person BUT still teach the core as the core allows one to reach that point of uniqueness. Teaching your uniqueness limits them to it when the core shall allow them to plant a seed, nourish it for a period till it flowers than allow for personal uniqueness, etc. Make sense? Thanks for another find posting! I'm not surprised. You may be aware that at least half of Isshinryu's karate kata are taught at the dan level in other styles. Originally, Sanchin was the last form taught. Chinese forms are very interesting. Not to sound mawkish, but some of them are beautiful to watch. It seems the internal styles' forms tend to be a good deal longer than in karate. Supposedly there's a Long Form (from the Yang style, I think) that takes up to half an hour to perform. Quite a workout. Thanks Frank. Welcome to my site. Right, nothing flashy or fancy in Isshinryu. You brought up some good points I left out. One of my instructors experienced the block-as-a-strike move first hand from Shimabuku many years ago. It was a middle block/back fist that caught him on the bicep that paralyzed his arm for about five minutes. Very effective. Thanks for your input, Charles. The Kenpo Gokui is tough to interpret. One could see it the way you stated, I see where you're coming from, but like you say it's "esoteric" - more than anything else in my opinion. It's definitely not your typical Dojo Kun, nor do I think it was intended as such. When I mentioned character building and good citizens the model I had in mind for this was Gichin Funakoshi. These were his ideals for the karateka. More than anything else I believe Shimabuku's priority with Isshinryu was to make it brutally effective. This is probably why US Marines took to it so readily. As for the sempai-kohai relationship and the like, that's inherent in any dojo. My understanding is that Shimabuku made changes in Isshinryu almost until the time of his death. I also experienced high ranking instructors who made their own changes (including blatant ommisions - a huge mistake if not grossly disrespectful), but I digress. There are certain arts that really are set in stone for posterity (the koryu of Japan, for example). That's the distinction I was trying to make. Very interesting - I said I'd not go back to TKD and the only karate I'd consider is American Kempo. However, I might just have to add Isshinryu to my list. For a while I had considered investing time in something like Bagua or Xingyi. The thing is, there's very few schools in my neck of the woods that teach internal MA. Great post. It's interesting hearing a little about Isshinryu karate though I think there are still quite a few similarities there with some of the more traditional Okinawan styles (or at least with my experience in Goju Ryu). I also like the idea of the slow progression of teaching a small number of kata. Even eight seems like a lot when you consider the fact that traditionally students learnt only sanchin and maybe one other kata that suited their body type. There are so many layers within any kata that unfold over years of training. The Tai Chi Yang Long Form (108 steps) usually takes between 15-20 minutes, except if you do extra-slow. To practice internal MA (as any other art) good instructors are a must. I never practiced your style, but competed a couple of times against practitioners in open tournaments (they were strong guys). Shotokan (JKA style) has more than 20 empty hands katas, no weapons. The thing in this specific style is that under Funakoshi many forms were introduced from other styles modified and with changed names. It's hard for anybody to master and understand so many forms. Specially taking in account that they were developed as a mnemonic method for technical application. MA researcher and instructor Patrick McCarthy pointed an interesting idea on the creation of forms that may be suggestive to their understanding. If practicing first the technique/application and then create the ritualized sequence or form. I guess it made perfect sense for the original creators and innovators of karate styles. I have a friend who's a longtime Shotokan practitioner. One day he was showing me a form - I can't remember what he called it. I realized about halfway through that it was a cognate of the kata Kusanku from my style. I recognized it, but barely, largely because it just seemed more linear and less circular in execution. Very interesting. A good rendition on my friend's part, but also a good example of the external-ness of Japanese karate. Just bought a book by McCarthy on the Bubishi. Not a recent work, though (1995). Really in-depth. I also have the Bubishi. McCarthy for years has researched Jap and Chinese MA in depth. Probably you know, but he founded a research society (http://www.koryu-uchinadi.com/). The site used to have interesting info, have not checked lately. Kushanku was renamed Kanku-Dai in Shotokan (there is also Kanku-Sho in the style, but I think it was created by Funakoshi's son Jigo). JKA got too much on the sports side of Karate and perhaps that explains excessive stiffness-linearity in the execution (Great influence of Nakayama Sensei in this). 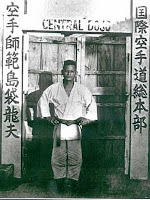 The separated Shoto-kai of Sensei Egami tried to keep the forms closer to the original Funakoshi's teachings. On so many katas in karate I was remembering something I read about Motobu Choki, one of the strongest Okinawan fighters from Funakoshi's time, who just mastered one form (Naihanchi / Tekki), but the advice was that you had to practice facing opponents to the side, no frontally how is mostly done today.